It’s interesting what happens right after a big event. The excitement and anticipation wears off and you are left with a hangover. I suppose it is the same for anyone who has a goal…you spend months thinking and dreaming about whatever it is you have chosen to pursue, and then, just as quickly as it all began, it’s over. 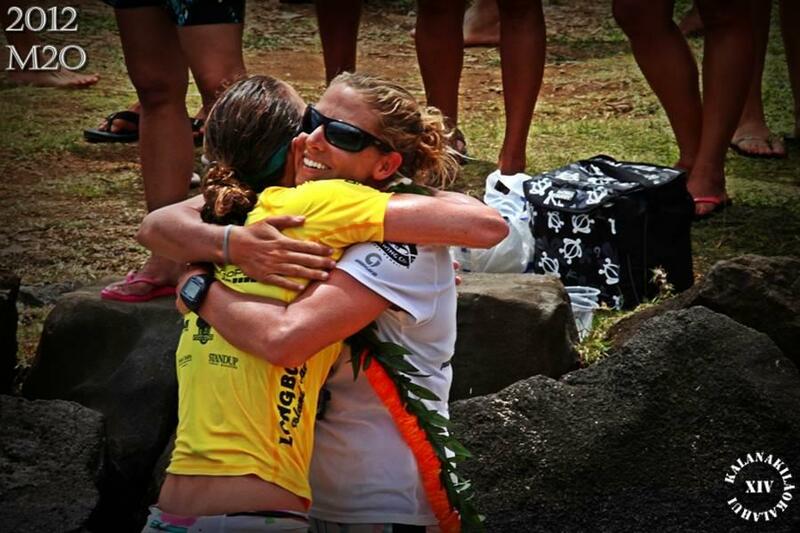 This year’s Molokai to Oahu race gave me a reason to train, a reason to learn, and a reason to dream. It has been a long time since I have had a solid goal to fixate on. I am not sure why I went so long without one, or why this particular race was what gave me a reason to start caring again; but it did. I think I had become tired of people asking me if I am tired of losing, or asking me why I suddenly am not paddling as slowly as I used to, and all of a sudden I had something to prove. Not necessarily something to prove to anyone else, but to myself that you are absolutely capable of doing whatever you want to as long as you are willing to work for it. So I started chasing a time. In order to be able to maintain the pace I wanted to go I had to get stronger and I had to get smarter, so I put together a training schedule and asked for help from those who know more than I do. For 12 weeks I had a plan. I knew where I would be on any given day and what I expected of myself. My friends and training partners were all doing the same, so it made working toward the time all that much more fun. I learned about heartrate, I learned about nutrition, and mostly just learned about myself. I began to recognize strengths and weaknesses that I had never knew I had and how to either capitalize on them or minimize them depending on the situation. When race day came, for the first time ever, I sat on the start line with minimal fear. I trusted in the work I had put in, the knowledge I had gained from people who were willing to help me, and as a result, the race went well. I did what I wanted to do…time wise, anyway, and I wasn’t the only one. At the finish line I got to sit and watch some of my best friends and favorite people finish crossing the channel for the first time. On three separate occasions I was brought to tears watching my friends do what they had set out to do. In those moments, winning and losing is completely irrelevant. Each person who crosses the finish line understands just what it took to get there, and it is an understanding that makes people want to do it again every year. Now that it is all over, the week since the race has been an interesting one. The past few days have seen me walking the line between contentment and uneasiness. People who know about this kind of thing tell me that it’s natural… that there is a definitive low that results from the recovery process. Your body is trying to repair itself, adrenaline levels are all over the place, and then the big question hits: What now? Now that the goal monster is awake, it needs to be fed. I’m not sure yet with what, but on Monday training will start over again, so that when the opportunity to challenge myself presents itself again I will be ready. 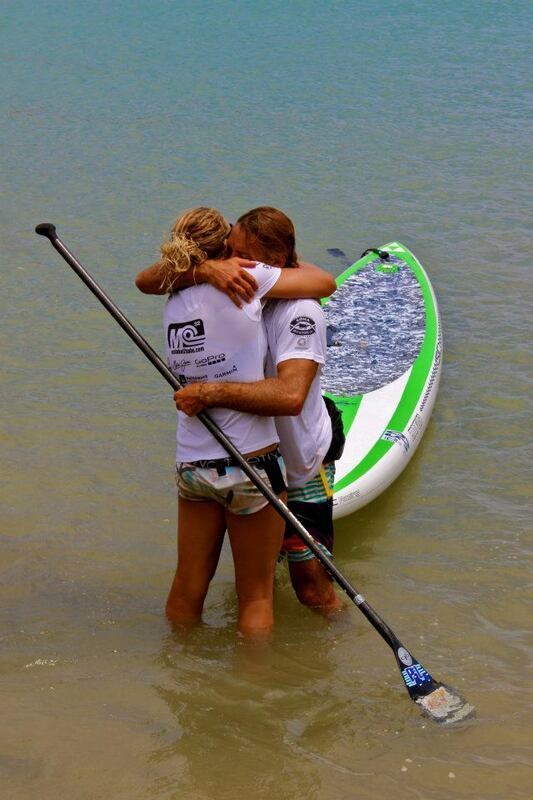 I need to make sure I thank those who supported me along the way, specifically Wayne Schaut who was willing to jump in the channel on numerous occasions for me, Jeff Muir and Sai Sooriyakumar who navigated and escorted me safely across (my boat guys are all time), Sonya Weiser, who, in addition to being an awesome friend, helped get the knots out and taught me about endurance training and nutrition, and all of my buddies who helped me train, even when I didn’t want to. Thanks also to Brent Allen who always is willing to share knowledge and help minimize my mental problems =). stickering up the board…thanks Wayne Schaut for the photo. Finally, thanks to Joe Bark. Without you, I wouldn’t have had any of the opportunities that I have had in the ocean, and I will be forever grateful for all that you do for me. Thanks also to Maui Jim Sunglasses, Surftech, Quickblade Paddles, Vertra, Future Fins, Kona Brewing Company, Wet Feet, Dakine and Surf Stronger for supporting me.